Engineered for active lifestyles, the Sport-Fi X7 combines high-definition wireless sound with a secure, locked-in fit for unparalleled freedom of movement. Incorporating Bluetooth 4.1 with Multipoint functionality, support for the apt and AAC HD audio codecs, and IPX4 sweat resistance, the Sport-Fi X7 is the most advanced Bluetooth in-ear headphone on the market, yet still weighs in at less than half of an ounce, making it the ultimate workout companion. Pros - Great sound for a Bluetooth IEM. Excellent fit. Cons - Bluetooth signal is really choppy. 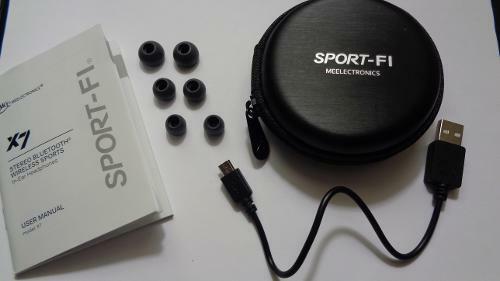 Before I begin, I would just like to thank Mike at MEE Audio (yep, not MEElectronics anymore) for providing the review sample of the Sport-Fi X7 in this review. Please note that I am neither affiliated with MEE or any of its staff, nor am I being compensated for this review (other than being given the opportunity to keep the review sample). Everything in the following review is strictly my own honest opinion unless otherwise stated, and all pictures are taken and own by me. Also, please take everything stated in the review with a grain of salt. Thanks! Having had a wonderful impression of the current state of Bluetooth-powered sound with the Brainwavz BLU-100, I felt it was time to take a look at something a bit higher-end. 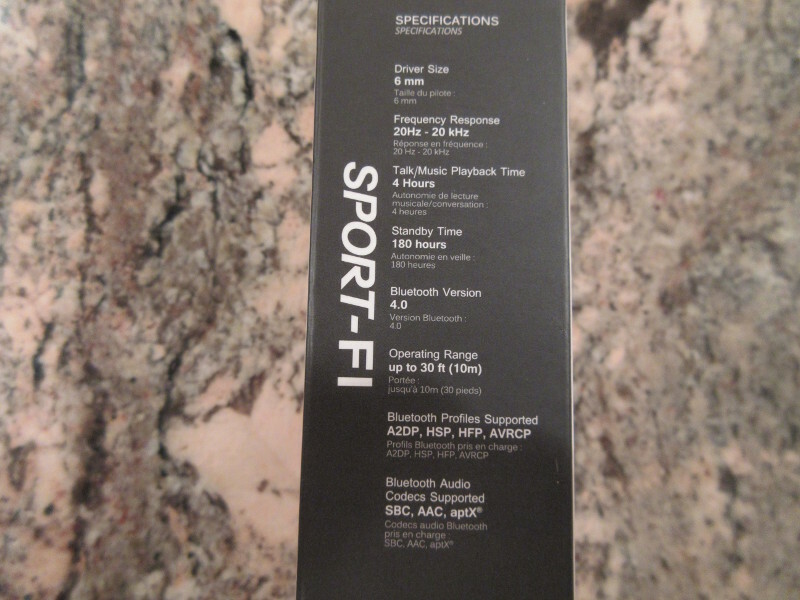 Fast-forward about a couple weeks later, and here I am with the Sport-Fi X7. Will these $80 Bluetooth IEMs catch up to the competition, or will they get left biting the dust? Read on and find out! I’m a 15 year old music lover. Audiophile? Maybe, but I’m not into the hobby deep enough that I could hear differences between two different $1000 cables. I do know a little bit about the hobby, and with that I write reviews like the one you’re reading right now. I listen to a wide variety of genres at any given moment – EDM to classical, jazz to heavy metal. I especially like acoustic stuff and stuff like Coldplay. Practically the only thing I don’t listen to normally is top 40s pop and country. As for sound preferences, I usually find something that fits in one of three categories: 1) V-shaped sig for electronic, 2) Balanced sig as an all-rounder, and 3) mid-centric or neutral for more intimate pieces. What I look for in headphones and IEMs is the full package – equal parts looks, build, and sound. Okay, maybe a bit more on sound. But I’m not the type to settle on something that looks absolutely ridiculous, even though it sounds good (i.e. Jecklin Float, K1000, etc.). I strongly believe in subjective opinions and would trust my own ears over measurements. However, I’m not too impartial to objective measurements and look those up to find a general baseline if I can’t get an in-the-flesh impression. So that was a quick rundown of my personal beliefs and preferences in this hobby; so as I stated earlier, please take everything in this review with a grain of salt. The Sport-Fi X7 arrives in a nice sleek box reminiscent of a few of Brainwavz’ IEMs (especially the S series). It’s got your general name and picture of the X7s, a list of accessories and specifications on the left and right sides respectively, and some written features on the back. Uncover the front flap, and inside you’ll see a window to the X7s in all its glory. Inside the box you get the X7s, a detailed instruction manual, two extra sets of eartips, a hard carry case, and a male-to-male, USB to Micro USB charging cable. Overall, it’s not much, but it does have all the essentials you need to get started. So no complaints from me. 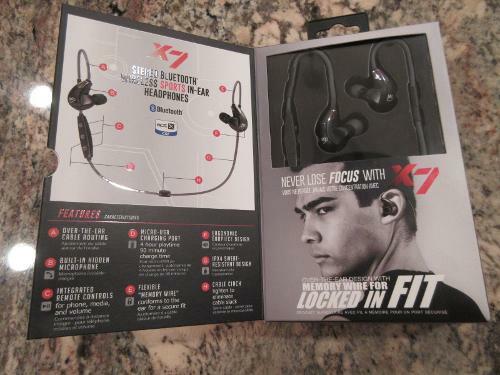 The X7s are, in my opinion, probably one of the best-looking Bluetooth earphones I’ve seen yet. With its sharp, streamlined design, they come out on top of quite a lot of Bluetooth earphones looks-wise – including its predecessor, the X6. 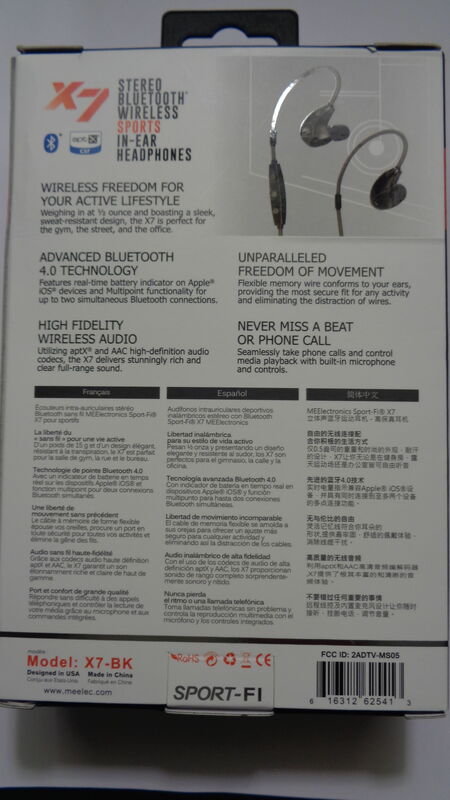 However, don’t expect them to only deliver here – MEE’s made sure to not skimp on any details in designing these earphones. First off, you’ve got a nifty LED on the right earpiece, which helps out a lot when you’re setting up the device (though the setup time takes less than a minute, the little detail here is nice to have nonetheless). 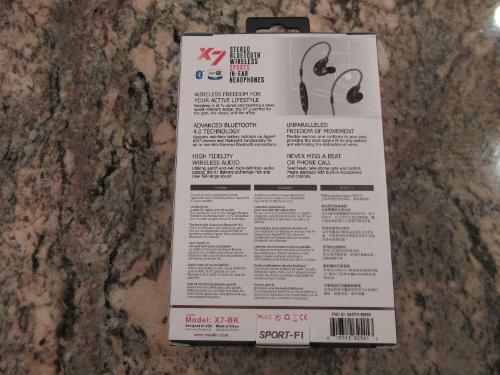 Next up, you’ve also got a “hidden microphone” which is basically the X7’s microphone being situated again in the right earpiece, in contrast to having the microphone being placed somewhere on the remote like most Bluetooth earphones have. Since the microphone is on the earpieces themselves, they don’t make any contact with shirts (eliminating rubbing noises) and have a consistent position, providing similarly consistent sound quality (we’ll cover this later). Speaking of details, let’s talk about their build quality now. Let me just say this – the X7’s build is phenomenal. 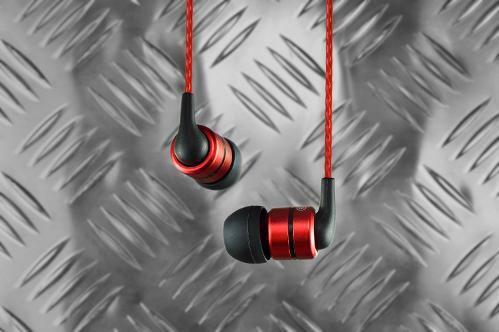 With extremely solid IPX4-rated sweat-resistant plastic housings, a thick but supple cable, and ample amount of strain reliefs pretty much everywhere, you can rest assured the X7s will keep running with you come hell or high water (okay, maybe not high water). But whatever the case, their build is top-notch. As for microphonics, that’s all but dulled down to nothingness thanks to the X7’s excellent fit, which we’ll go over in the next section. Being a sport-oriented earphone, MEE made sure to incorporate a multitude of features to ensure a completely secure fit and maximum comfort. First off, you’ve got the ergonomic housings which fit snugly in the concha. 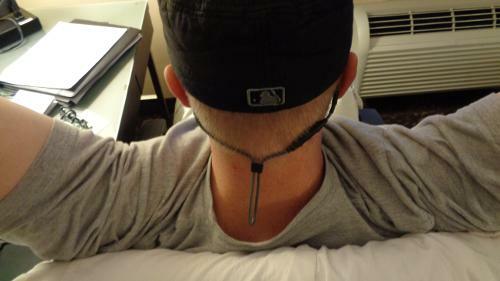 You’ve also got the flexible memory wire that you adjust around your ears. And to top it off, you’ve also got a cable cinch which you adjust to keep cable slack at bay. So, in short, fit and comfort is just about perfect for me. As for isolation, it should do well enough to keep you focused on your music, away from everyday suburban traffic and your fellow gym rats. The X7’s listed specs are pretty great, and what you would expect from an $80 current-gen Bluetooth IEM. It’s got just about all the bells and whistles one would be looking for in a Bluetooth IEM, with Bluetooth 4.0, AptX support, voice prompts being just a few of those. And the best part? It works. Because that’s what really matters. 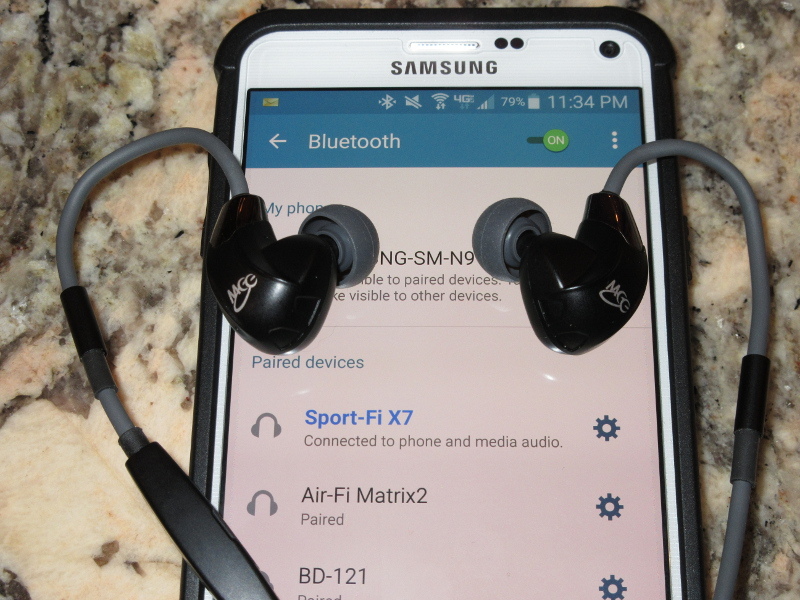 Setting up the X7 should be pretty easy if you've already set up a Bluetooth audio device before. The initial pairing process only takes a few seconds, and connects to my iPod and iPad almost instantaneously. They reach their advertised operating range just fine, but results may vary as the full 10 meter range is only reached in an open space with a direct line of sight to the source device. I've heard reports from some users of an intermittent or overall really choppy signal on the X7 even at close range. And personally, this also happens on my iPad 3, even with WiFi off. Oftentimes drop-outs on Bluetooth devices are caused by Bluetooth, cellular, or WiFi signals nearby, and that jams up your own Bluetooth signal, causing the aforementioned choppy signal or outright drop-outs. If one turns on cellular and/or WiFi signals, it’s going to be even worse than it already is without them, so I’m honestly pretty disappointed. Not even the Brainwavz BLU-100 was this sensitive. On the flipside, this never happened on my iPod Touch. The source equipment I used for this review is my iPad 3 and a 5th-generation iPod Touch. As the X7 is a Bluetooth IEM, there are no amps or DACs in between. The eartips being used in this review are the included stock medium-size silicone eartips. The EQ software being used is TuneShell (a free app) running on the iPad 3. As always, my test tracks are available here, although I will link specific songs in the assessment for a more direct point of reference. The X7 has been given at least 50 hours of burn-in prior to writing this review. So far, I haven’t noticed any differences in the sound, so without wasting any more time, let’s get right to it! 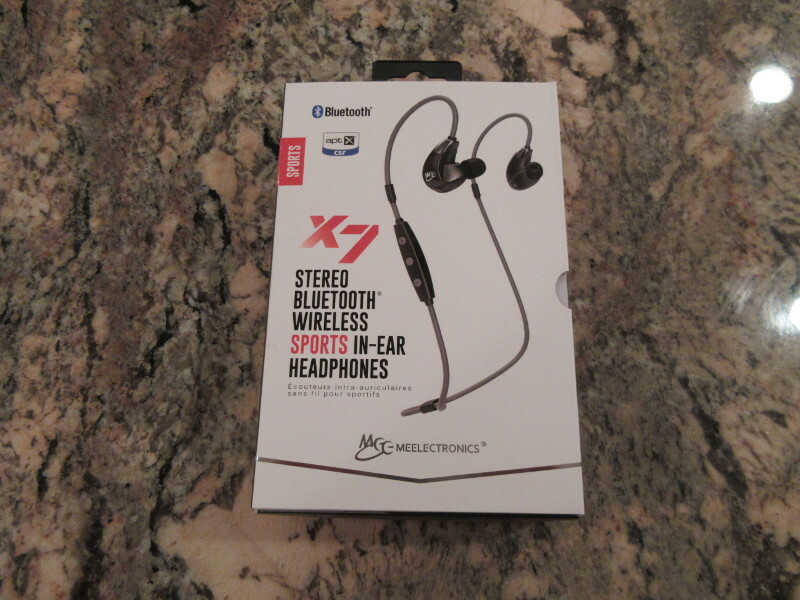 I'll be honest, I was quite impressed with the X7's bass performance. It's got more than enough punch to satisfy the average consumer, but is surprisingly tight and articulate enough for one to discern individual notes on an electric bass (Daft Punk – Lose Yourself to Dance). 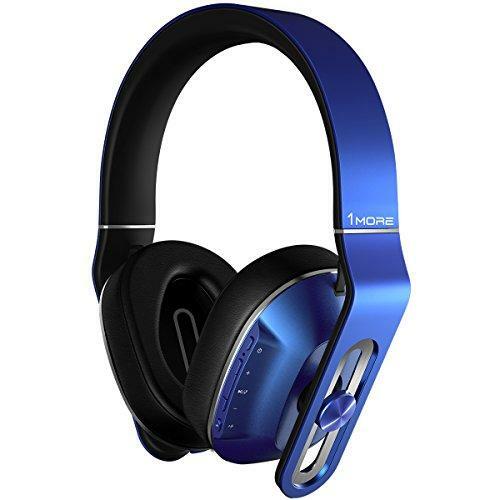 It's also got a nice amount of extension – perfect for rap or other electronic genres where oftentimes the bassline goes down deeper than most incapable headphones and earphones can reproduce properly. 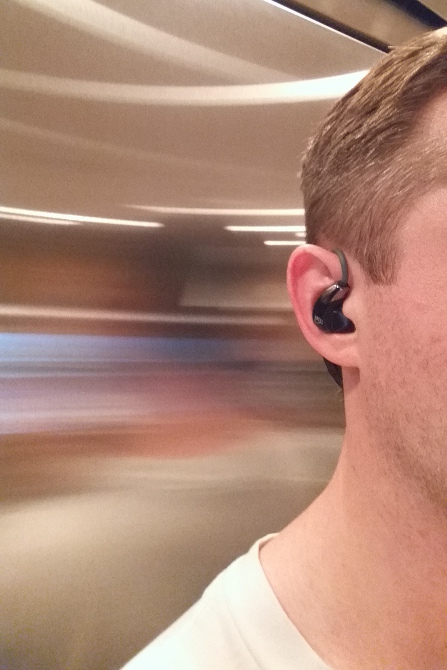 The X7's midrange is no slouch, either, which is also very surprising. It's got a lot of clarity and isn't excessively warm or thick. In fact, they actually sound quite thin – a trending characteristic amongst MEE Audio's more consumer-oriented products. But even then, they’re still very clear and are definitely audiophile-grade. Vocals are actually quite forward, contrary to my expectations, and they have a rather sweet tone to them. The X7’s treble really completes the sound signature off with its light, crispy response. It’s lively and a bit bright, but isn’t sibilant at all, which is a huge plus. It really gives instruments the snap that I look for in an IEM’s treble response, and MEE did that in just about the best way possible. The X7 performs pretty well for a Bluetooth IEM when it comes to soundstage, giving you a good sense of space as you listen to your music. Don’t expect too much out of it, though – they are far from expansive and the imaging feels pretty 2-dimensional. 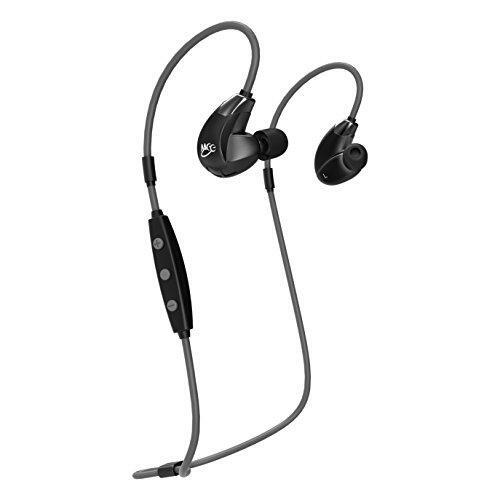 The X7s, being a sport-oriented IEM, has a sound that’s designed for techno, EDM, and other bass-heavy music or anything that gets you into your jam on your workout (Hellberg – The Girl). And it’s easy to say they definitely play those genres very well. However, I found them to perform nicely with even acoustic-based music. Fast-paced heavy metal and busier recordings were where the X7 met its match – it simply couldn’t keep up with everything that was going on. To summarize, the X7 sounds great – they have a fun, motivating sound signature that really keeps you pumped throughout your workout – that is, assuming that workout in question lasts about 4 hours. In any case, for a wireless IEM, I’m impressed at how they sound – in fact, I’d actually like a wired version of this just to get rid of the battery life limit. The X7 responds fairly well to EQ, although personally I don’t really find any good reason to EQ the X7 since it already sounds very good straight out of the box. They perform nicely with bass boosts on both software and hardware, and you can pretty much tweak them to anything within reason. But remember that just like every other headphone and IEM out there, EQ won’t make your $100 gear sound like a $1000 LCD-2. The MEE Audio X7 retails for about $80 (you can find them on the MEE website here). And for this level of sound quality in a Bluetooth IEM, I’d be hard-pressed to find any better at this price. Even against wired sets the X7 stands their own – we’ll cover this in the next section. I’ll be honest, the M6 PRO was good, but their V-shaped sound signature was way too harsh for me, with its bright and grating treble that clawed at my ears whenever I listened to it. And that makes the X7 even more of a shocker since it sounds better than the M6 PRO, but is a Bluetooth IEM. Now, how cool is that? 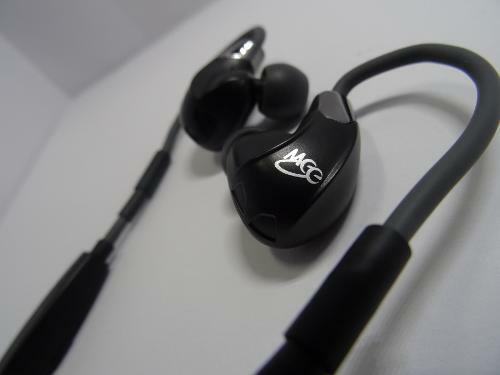 Then again, the M6 PRO does win in other factors being a wired IEM without any extra tech on it, but for me, the X7 wins. 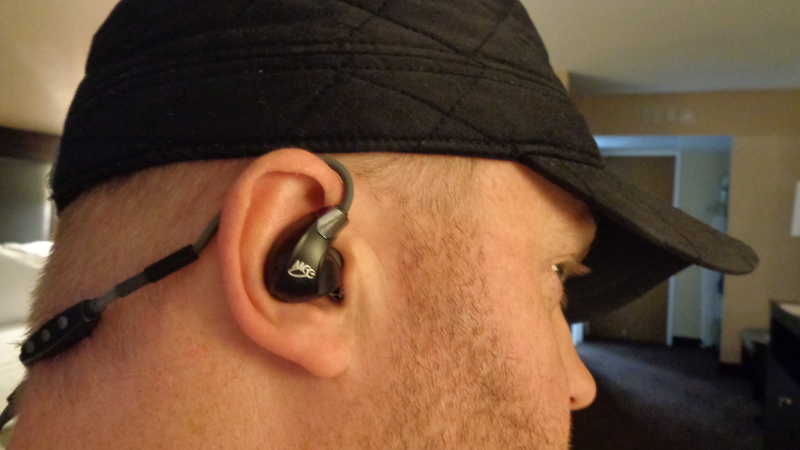 For a Bluetooth IEM I’m quite impressed with the MEE Audio Sport-Fi X7. They feel great, look great, and sound great. But they’re not without their flaws. The X7 has pretty nasty connectivity issues, with occasional to frequent signal chops and high sensitivity to other wireless signals in the vicinity. If this was a wired IEM, this would’ve been pretty amazing. Sadly, it’s not. Nonetheless, the X7 has quite a lot of potential in them and if MEE Audio is capable of fixing them in the future (which I’m sure they are), we might have a very competitive Bluetooth IEM coming around that will most certainly go up against even wired IEMs. The X7 comes in a nice package that gives you what you need and only what you need. It isn’t overly generous, but hey, it’s not too scant, either. MEE paid a very careful attention to detail in creating the X7, creating an IEM that perfectly captures its sport-oriented target market. Its fit is, for me, just about perfect, with a very secure, very comfortable wear that will run with you to the last mile. Unfortunately, that might not be the case as occasional chops and outright drop-outs will hinder one from using the X7 as a primary sport IEM. 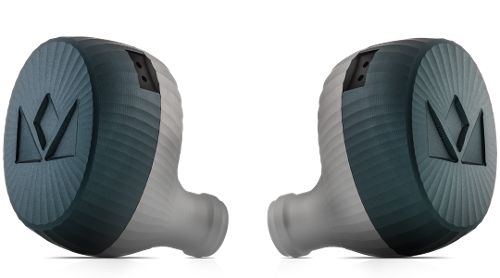 Their bass is great, though, with ample punch to keep you motivated throughout your workout, but with a nice audiophile twist, with decent speed and a tight kick. 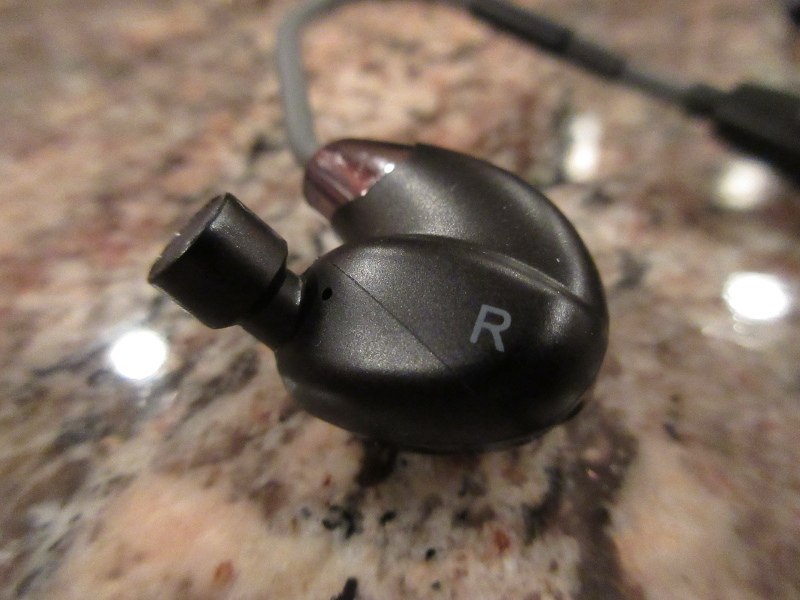 The midrange is not bad, either – it’s a tad thin, but it packs quite a lot of clarity that brings out vocals and instruments much better than your standard fare of sport-oriented IEMs. The X7's treble finishes up the general sound signature of the IEM, with a light, crisp response that adds the needed air and snap to one's music. 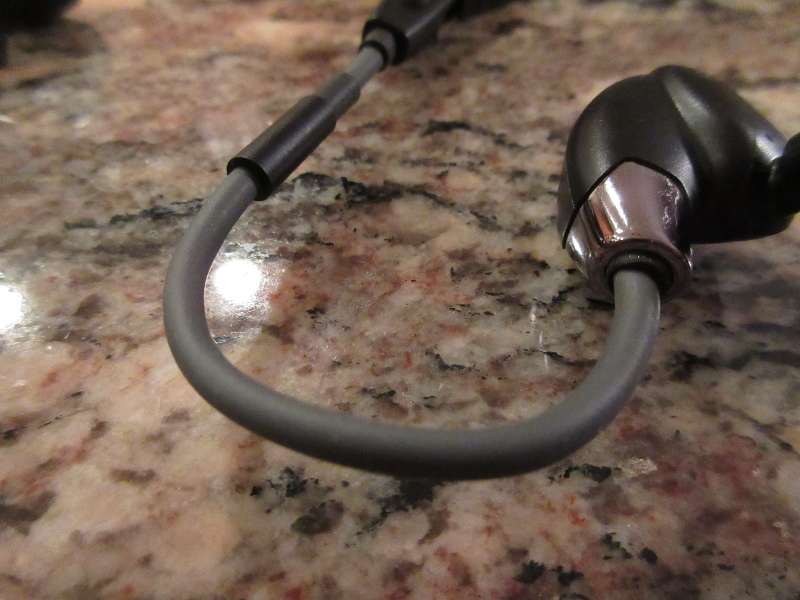 The X7’s soundstage is pretty good for a Bluetooth IEM, but don’t expect too much out of it. They’re fairly responsive to EQ as well, and should be able to handle more than a little bit of tweaking. …But a lot of little quirks in the actual Bluetooth tech inside the X7 press me to tell you to make careful considerations if you’re ever thinking of buying them. Fix the Bluetooth tech in there. Otherwise, just make a wired version of the X7. The results would be pretty amazing IMO. Again, I would just like to thank Mike at MEE Audio for providing the X7 sample you see in this review. It’s been quite an experience getting to hear current-gen Bluetooth audio, and frankly, it’s quite amazing how far we’ve come to reach this point. I mean, I would never have expected this level of clarity and performance from a wireless IEM – to the point where it would actually go up against wired sets without a problem. So I just want to thank Mike for that opportunity. As always, you can check out the rest of the images I took while reviewing the X7 here. 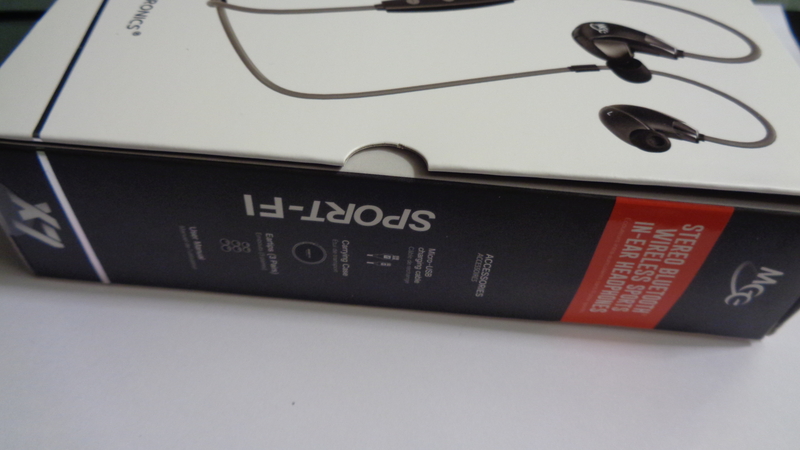 Be sure to check us out on our Facebook page to see updates on all of our headphone reviews. We’ve got lots of cool stuff to review over the coming months, so be sure to leave a Like on the page to keep track of all of them! This has been thatBeatsguy of DB Headphones; thanks for reading! “MEE is home to a group of audio enthusiasts who enjoy hearing music at its absolute best. We spread our passion by crafting innovative high-performance audio gear in order to let music inspire everyone as it inspires us. 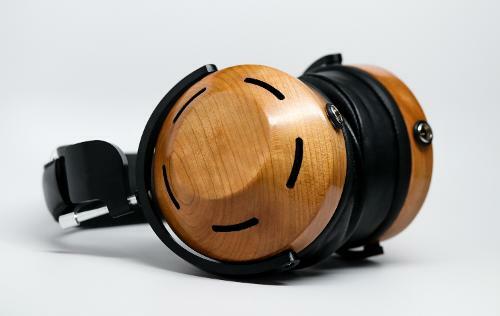 Where others see a pair of headphones, we see the final step in experiencing music as it was meant to be. This is why we obsess over every detail of how our products look, feel, and sound, bringing you the ultimate listening experience. Since 2005 we have been committed to crafting headphones and earphones with exceptional audio quality and design, winning acclaim from casual listeners and audiophiles around the world. Specializing in sports, wireless, and high fidelity headphones, MEE is committed to providing the best user experience, performance, and value with every product. 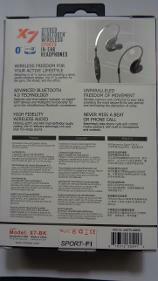 The best wireless headset fitment I have tried! Before I start my review, I would like to Thank Meelectronics for providing me with a review sample in exchange for my honest opinion. When it comes to running, biking, working out, and other physical activities – headphone cord is the last thing you want to get in your way, thus wireless headphones make a perfect sense during these activities. In particular, a style of wireless headphones with a pair of earbuds connected by a wire with in-line remote control has been very popular for active lifestyle. 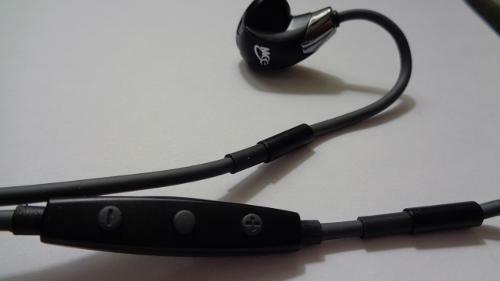 But regardless of sound quality or controls, one fundamental problem that every single headset in this category faces is lack of secure fitment to keep up with intense workout. Most of these headphones have a large cylindrical shape shell that sticks out of your ear and houses drivers and all the electronics, including micro-usb connector. As a result, you have to rely on either larger size eartips (for a tighter fitment) or attached wings/fins anchored around concha area of your ear. 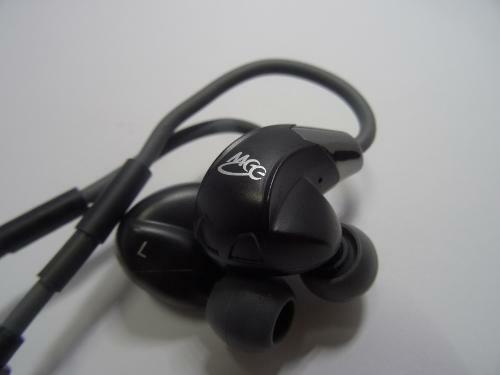 To mitigate this problem, Meelec guys came up with a great solution of a modified bean shaped shell, a similar kind you’ll find in Westone and Shure IEMs, with a comfortable memory wire and all the necessary wireless guts to keep Sport-Fi X7 away from an umbilical cord attaching it to a sound source. 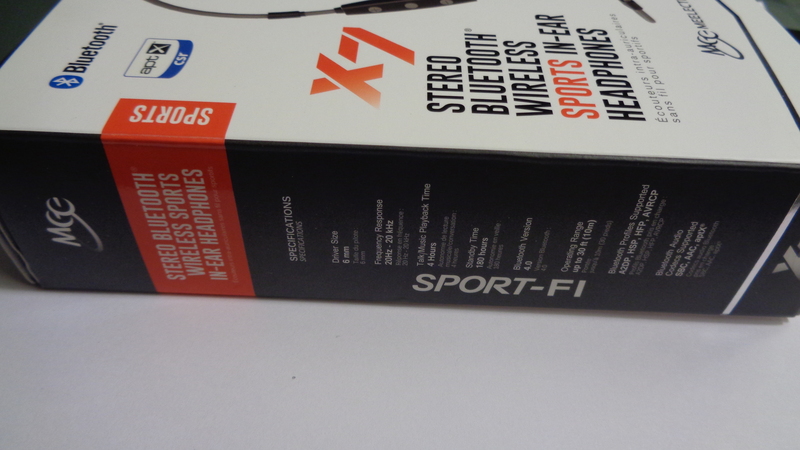 As a result, they created probably one of the best secure fitment sports wireless headsets I’ve tested to date. Some might argue there are other wireless headsets with earhooks or neckbands, but they all pre-shaped to universal non-customizable fitment and neckbands bounce as you move around. Here is more about X7 and why I found it to be so good. 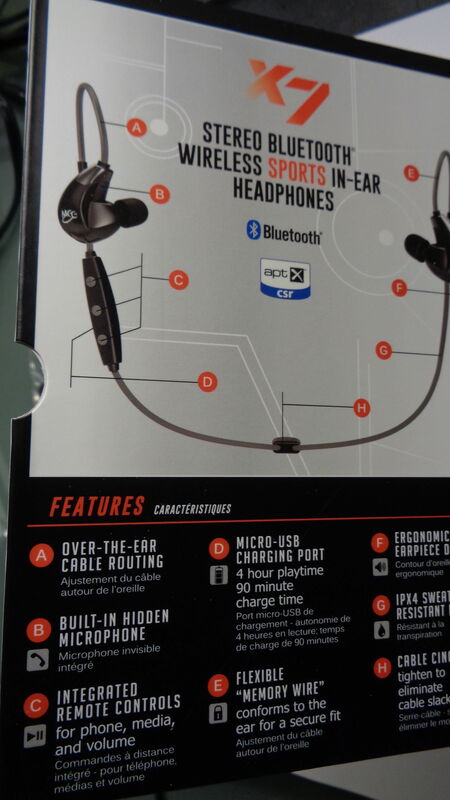 Arrived in a premium packaging, it has a very bold cover image with a clear statement of this headset being different from others, including “SPORTS” in red capital letters to get your attention. With plenty of functionality info on the back and a detailed spec on the side, you can also find addition description when you flip the magnetic cover open which also reveals the actual X7 under a clear display setting. Out of the box when you remove the plastic form-fitted tray, you'll find X7 and a storage case with all the included accessories inside of the case, and also a detailed manual booklet. The accessories include a charging usb to micro-usb cable, just a generic type which is obviously compatible with any smartphone charger, and a set of S/M/L pairs of silicone tips. Meelec is actually well known for making their own custom eartips, and you can see these are custom tips with tapered down edge of the inner core. 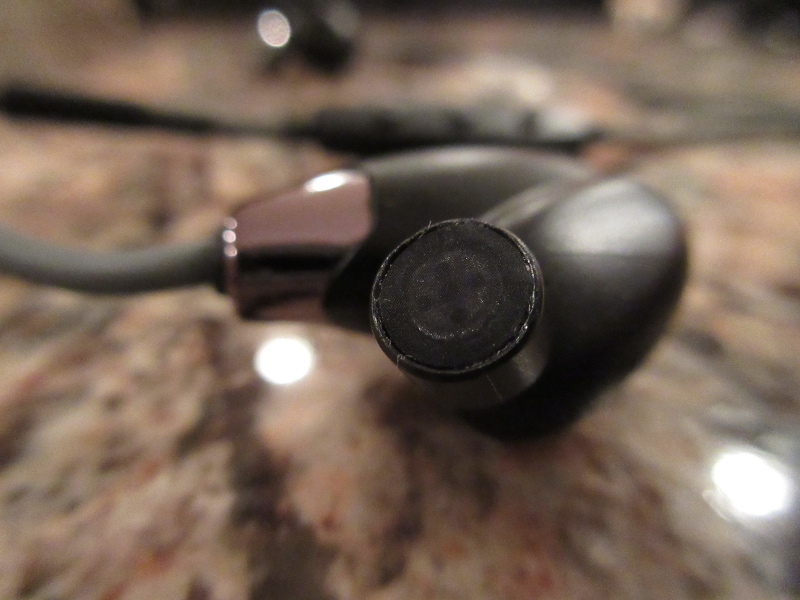 Since a nozzle of X7 shell is not a uniform barrel (it has a wider tip area), the eartips are designed for a better wrapping around that nozzle tip so it doesn’t slide out when you remove headphones from your ears. A little detail, but still important. 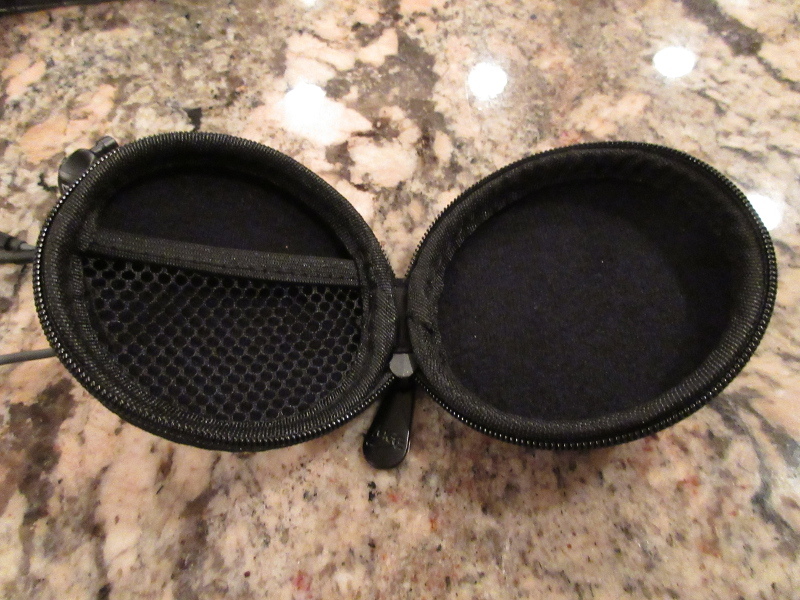 Also, I was glad that included zippered case was larger in comparison to a typical round storage case. When you are dealing with IEMs and a typical cord you wrap around 3 fingers for storage – you can live with a smaller case or even a pouch. Here, you are dealing with a memory wire that could take a little while to shape to your desired perfect fitment. Using smaller case will mean that you have to crumple up your work when stuffing it inside, just to start all over again when you take it out later. With a larger diameter round case, I was able to leave memory wire shape intact, just wrapping around flexible part of the cord. This was a big deal to me! 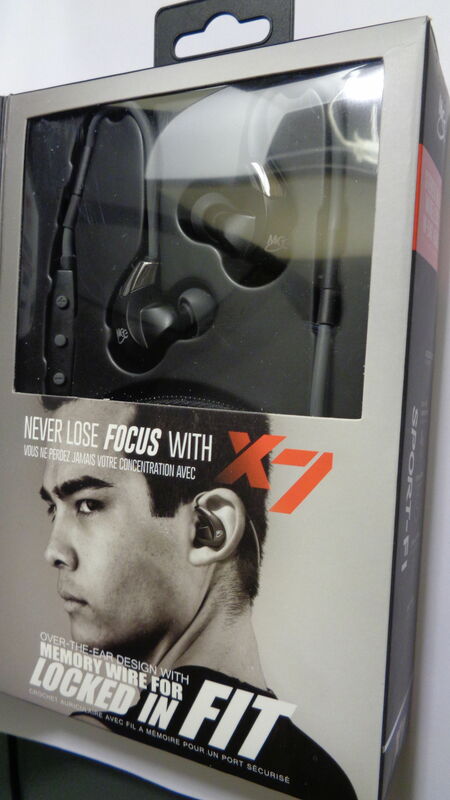 I already mentioned a little bit about the design and the shape of X7 earpieces. 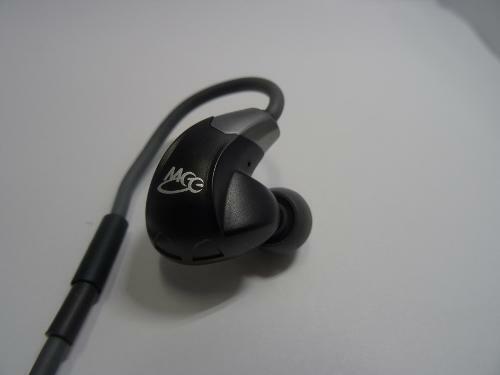 They have a modified bean shape of the traditional Westone/Shure design. As a result, nothing sticks out of your ear, and the cord comes out and wraps behind your ears. 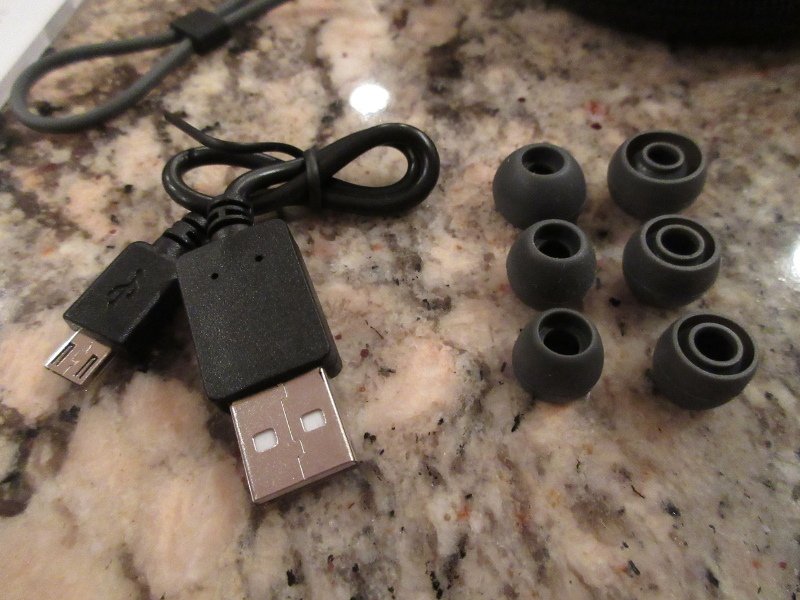 The shell itself is lightweight, plastic, and the whole headset with cables/remote weights only 13g. When you look closely, you can see an air vent pinhole at the base of the nozzle, an important feature for acoustics and perhaps to relief some air pressure in order to avoid driver flex. Often with other sealed headsets there is no vent for air to escape when you insert earpieces in your ear, and in past I found issues related to driver flex especially when I go through tip rolling to improve a seal. Also, each shell had a clear L/R marking. Attached cable is rounded and has a durable rubber shielding. It’s not too thick or too thin, and just perfect to handle extreme weather elements. 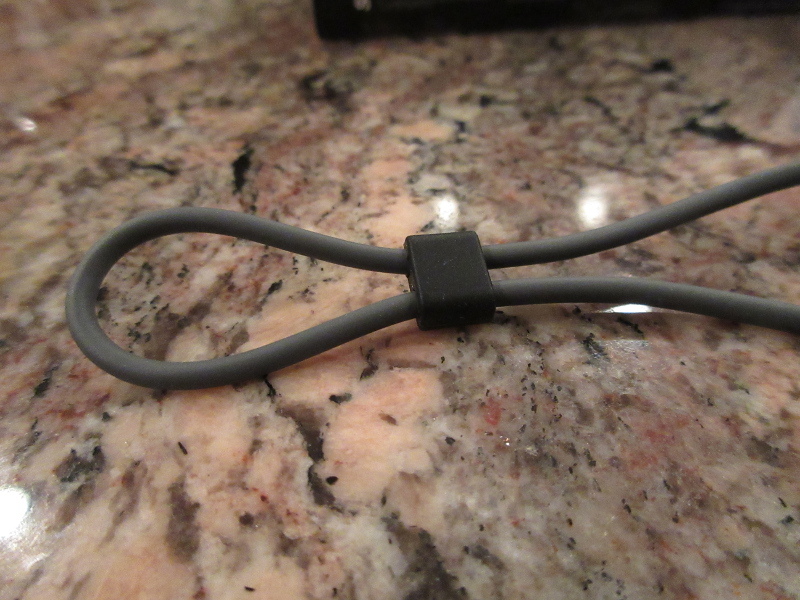 The joint between memory wire and the rest of the wire has a hard plastic shield piece and additional strain relief. There was also a strain relief on each side of the in-line remote. For a more convenient adjustment, Meelec also integrated a rubber cable cinch on the back with just enough friction to keep it from sliding and to make sure cable doesn’t dangle in the back of your neck. Everything about the build and the design of X7 screams heavy duty construction and durability, but it’s still lightweight and very flexible. In-line remote is plastic and has 3 multi-function rubbery buttons with an easy to feel shape which helps since you have to access it blindly behind your neck. A shallow height of the buttons with a close placement next to each other has been a problem for me with many other similar style headsets I tested in the past – here Meelec got it down to perfection, at least for my personal taste. Buttons have multi-function assignment with the one in the middle used for Play/Pause/Call, and other two on the sides of it with +/- to change a volume with a single click and skip a track next/prev with a long press. 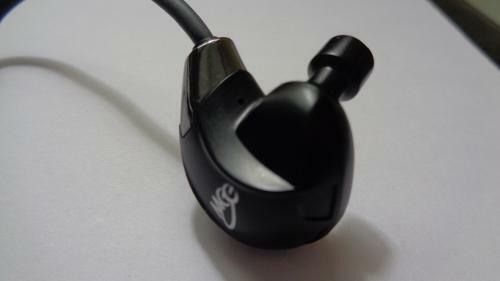 With other similar style headset, charging is implemented through micro-usb connector located inside of the shell housing, thus a need to make it longer and bulkier. Here, Meelec came up with something which I have not seen with any other headset – micro-usb charging connector located in the remote!!! 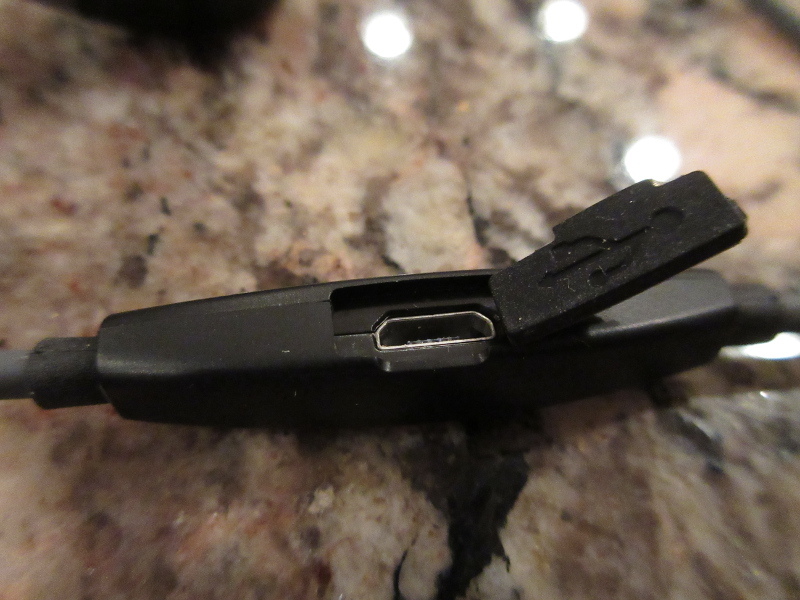 With a small rubber flap cover, it seals the port tight to stay consistent with IPX4 sweat-resistant rating. And speaking of charging connector, in my opinion 4 hour battery life is one of the few negatives I found with X7. From my experience, 6 hour battery endurance is a perfect balance for 2+ workout sessions in case if you forget to charge it up, while with 4 hours you might end up short during your second workout. This is just my personal opinion. 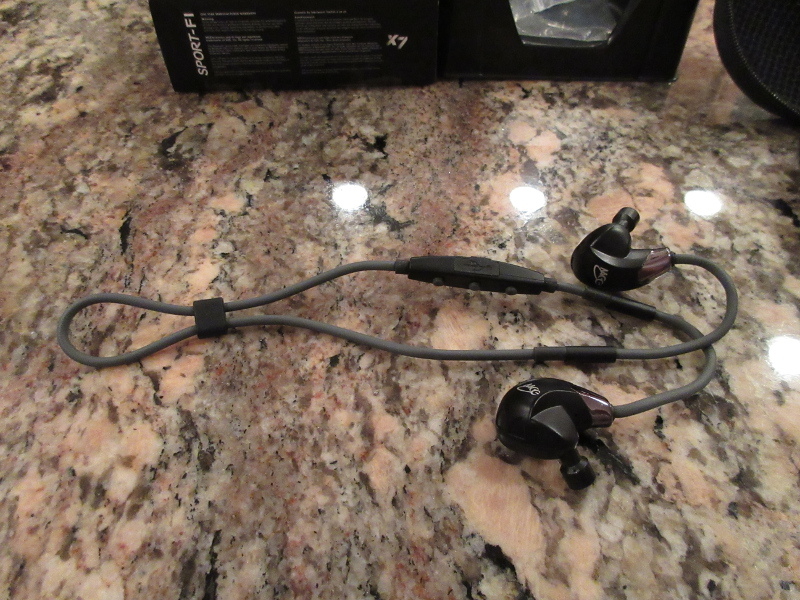 When it comes to pair up, it was no different than any other wireless headsets I tested. You hold the middle button, which also has Power functionality, until you enter pair up mode, and select the headset from a list of bluetooth devices visible to your phone. After that, headset was paired up quickly every time I turn the X7 power on, and it got connected to a phone and media audio without a single hiccup. The operating distance in open space was close to 35ft, but it was a bit of a stretch with some occasional stuttering especially if I step in another room. Cutting distance short down to 20-25ft worked better for my use with Note 4. Phone call quality was actually not bad at all, thanks to another Meelec “innovation” of placing the mic in the Right earpiece, closer to pick up your voice. Every other headset has it inside of in-line remote, relying on sensitivity of mic but forgetting that remote is going to be placed behind your neck. Here, it was a great idea to place it right inside of headset to bring it closer to your face. When it comes to a sound, X7 has the usual Dr Jekyll / Mr Hyde syndrome depending on the size of eartips you are planning to use. With a set of large eartips, to ensure the best seal, I'm hearing a rather balanced sound with a noticeable amount of bass boost in sub-bass region to produce a strong low end impact which gets your blood pumping during a workout. But when going down in size to a set of smaller eartips to loosen up a seal, medium for me - sub-bass levels off significantly (as expected). 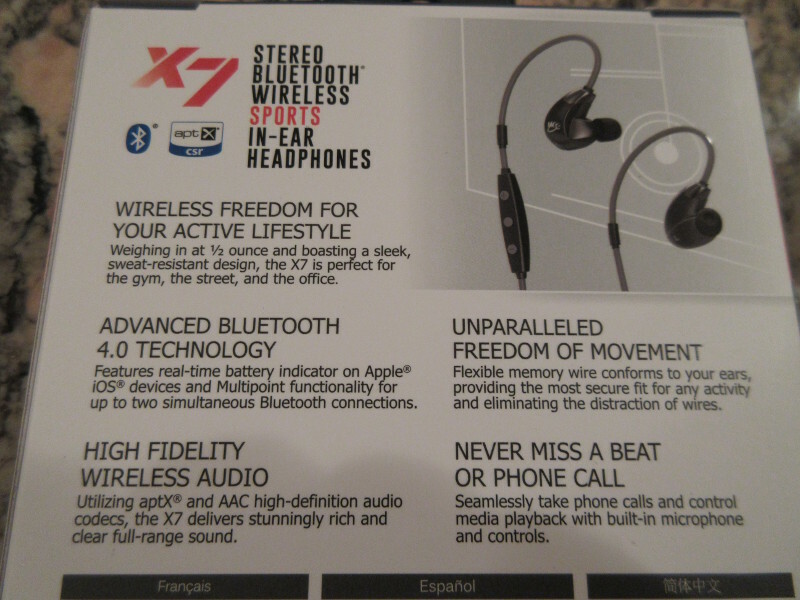 Typically with this type of wireless headsets I need to use the largest eartip to make sure earpieces stay firmly in my ears, but with X7 thanks to their ergonomic design and memory wire - I didn’t have to worry about it anymore. Regardless of this "bass boost" being either on or off depending on eartip selection, you still hear a clear and detailed organic mids with a nice body in lower mids and smooth details in upper mids, and also rewarded with a nice and clear treble without any sibilance or harshness. Even with larger eartips for a more bass impact, I felt the low end was well controlled without spilling into lower mids. I was going back'n'forth between eartips while trying to decide which one I prefer more because with large eartips in some EDM tracks sub-bass was getting a bit overwhelming, while with medium eartips in some mellow tracks I was craving sub-bass boost to balance out a sound with more warmth and body. At the end I found a happy medium with a pair of my trusted large size JVC spiral dot tips that give me a perfect seal for a tight bass impact while their large bore opening provides a great balance with brighter upper mids and treble details. In conclusion, I definitely enjoyed using Sport-Fi X7 and found them to be at the top of the game for anybody who is looking for wireless headphones when doing some serious physical activities. 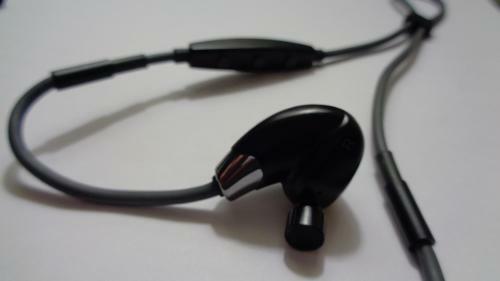 This Meelec model introduced a number of innovations I haven't seen before with any similar type of wireless headphones like moving a charger to in-line remote and moving mic out to an earpiece, using a built in cable cinch, and the first one with an audiophile shaped shell design and excellent memory wire implementation. Even when it comes to a sound, after finding a perfect pair of eartips - I was very impressed with a balanced smooth clear sound of these wireless headphones, a sound that can go head-to-head against a number of wired headphones even in higher price category. Brooko, Hisoundfi and hakushondaimao like this. @Bananas Ananas : do you sweat profoundly? What did Meelec say after receiving a return, did it get drenched and stopped working? That's quite possible. And btw, I'm not writing this in any negative way, because I don't sweat too much when working out, but I have read many other posts (everything from jaybirds to plantronics, etc.) where people apply some aftermarket sweat repellent coating to mitigate the same problem. Or better yet, sweat usually enters headphones through a nozzle. What if you try using some of the ComplyFoam eartips with a wax guard? That creates a barrier to keep sweat away. I indeed sweat a lot during most of my workouts and that's probably the reason for Meelectronics X7 giving up quickly on me. My latest pair just shut off during sweaty exercise routine. The first two broke after workouts, so that when I tried to turn them on the next day they wouldn't respond anymore. Red light stays on when trying to charge a broken unit, but it never goes away and none of the headphones' functions are working. Meleec doesn't really comment anything when they receive broken units. Thank you for your tips! I should definitely try out using ComplyFoam tips and see how they affect the situation. I've been curious about these. I ended up buying the Metro2 since it was twenty bucks cheaper and I'm quite pleased with those. Glad you were able to review these and give a heads up on Bluetooth gear. I honestly haven’t been much of a fan of bluetooth audio until recently, with the main reasons being functionality and sound quality. In preparation for a recent trip to Florida I purchased a pair of Meelctronics AF62 bluetooth headphones. I was hoping to get a pair of bluetooth headphones that would make traveling more convenient. Although the AF62 didn’t isolate quite as well as I would have hoped, I was really impressed with the functionality, and most of all the sound coming out of them. This was the first time I felt like I could confidently say that a pair of bluetooth headphones could hang with many wired cans. 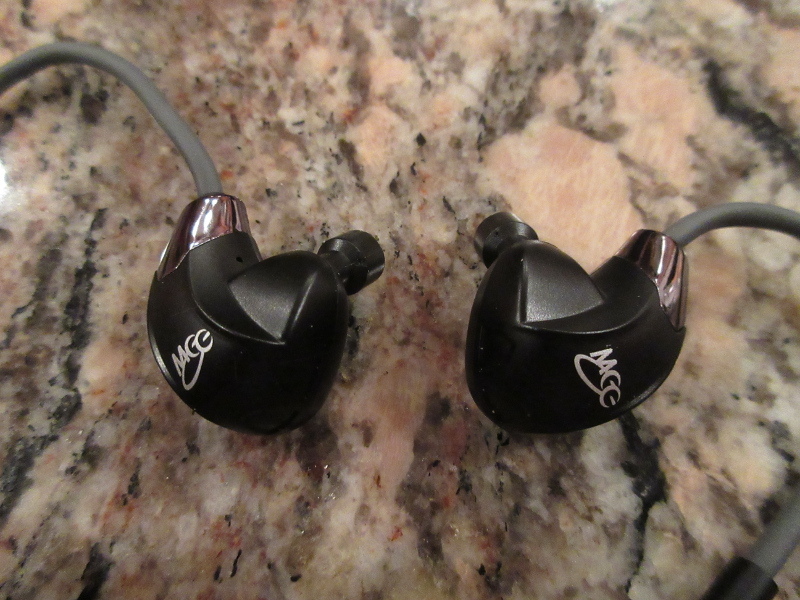 I contacted Mike at Meelectronics to share my positive experience and asked him if he had any other bluetooth models (primarily in-ear monitors) that had sound quality on par with the AF62. Within minutes I got a response regarding the earphones I will be discussing in this review. I was given an opportunity to sample this product in exchange for my honest opinion and review. I am in no way affiliated with Meelectronics. There’s something about quality DAPs, DACs, amplifiers and earphones that intrigues me, ESPECIALLY if they can be had for low prices. I’m a budget-fi guy. I will buy the $5 to $500 earphone that looks promising, in hopes that I will can discover that one new gem that can compete with the big names in this industry. If you look at my Head-Fi profile you will see that I have purchased many, and I mean MANY different headphones and earphones ranging from from dirt cheap to hundreds of dollars higher end products. For me, its more about getting great price to performance ratio, and hearing a variety of different gears with varying builds and sound. With this hobby we tend to often times pay a lot of money for minor upgrades. One thing I’ve learned over the years is that price DOES NOT necessarily indicate good build and sound quality. I’m always looking for great audio at a great price. I’m after headphones and IEMs that give me the “WOW” factor. I can appreciate different builds and sound signatures as long as they are ergonomic, and the sound is pleasing to the ear. It is my pleasure to share my experiences with audio products and make recommendations based gear I have tested and reviewed. The X7 came in a very sharp white and black box. The front of the box had a nice picture of the product with a brief description. The front of the box had a flap that opened up to display the product with a clear plastic display, and on the left there was a diagram explaining the several features that this model packed. I will admit, I was very impressed with the packaging and display. The back of the box had a little more information, along with info in several different languages. It honestly wasn’t anything more than what was displayed on the front and inside flap. The sides of the box had some technical information on one side, and accessories information on the other. The X7 comes with a shortened usb cable for charging, and a clamshell case. These tips are very supple silicone that creates a great seal. One thing to note about these tips is that they are specially designed to fit the X7 hozzle. Because of this design, tip rolling is almost impossible. The good news is that the supplied tips are so well designed it was easy for me (and I assume for most people) easy to get a vacuum seal. These are some of the best sealing and isolating tips and monitors I’ve ever used. 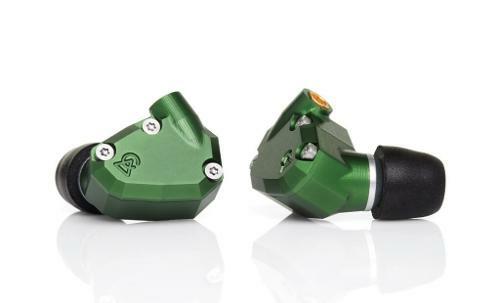 The housings are quite large for an in-ear monitor, but are designed in a way that they fit in my ears perfectly. To put this into perspective, I have issues wearing the Monoprice 9927 IEMs, but these I have no problems having them fit comfortably for hours. The right housing holds a red/blue light that indicates the products functions. Solid red means it is charging, solid blue means it is turned on and connected to a device, flashing blue means it is in pairing mode. This is an epically designed cable. The memory wire (which I’m usually not fond of) works perfectly with this design. It is a supple rubber material that bends into place with ease and really makes them fit wonderfully with the behind the head cable cinch. 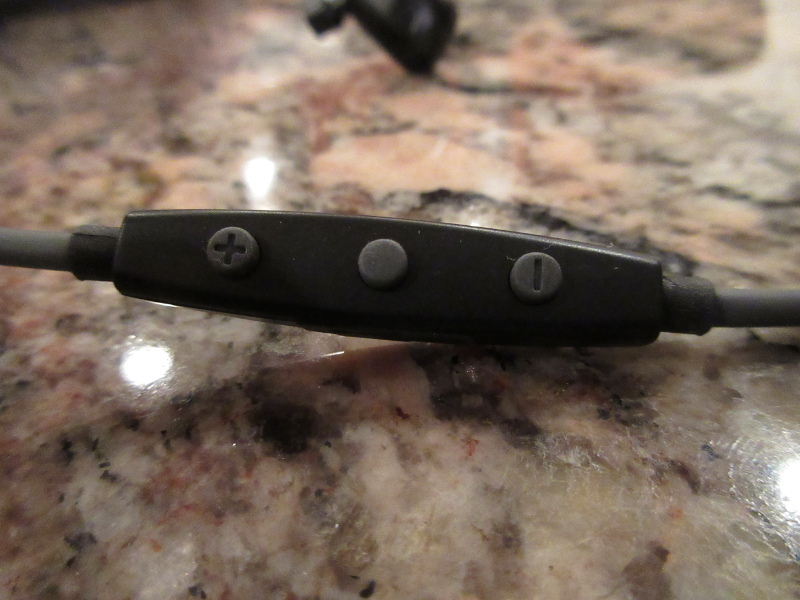 The cable is thick, durable, and has a three button remote built into the right side of the cable. The fit on these are fantastic. I honestly can’t think of anything that would make these fit any better than they do. They seal well, the memory wire works great, and the cable cinch in back finishes off any slack in the cable. I can imagine these working for any physical activity without the need to fidget with them whatsoever. I will increase my rating on these because of their fitment. They are that good in this area. These connect like many other bluetooth headsets. There is no NFC support (no biggie IMHO). After an initial charge (approximately 90 minutes), press and hold the center button on the remote. Continue to hold the button after you hear the headset say “power on”. A few seconds more of holding that button you will hear “pairing”. Once this is done, simply go to the bluetooth settings on your device (assuming you already have this turned on) and look for the Sport-Fi X7. Connect and you are all set. I had no problem connecting. There is an instruction booklet that comes in the package incase you have any problems connecting. The three button remote has a center button, and up and down button. It has many different options for controlling your cell phone in both music playback and phone mode. I will cover the basics for my LG G3 in this review. Music Functions: The center button operates as a play/pause button. The + button controls volume with a single click, and long pressing it changes the track. Just the opposite, the - button lowers volume with a single click, and starts the track over with a long press. Phone Functions: The center button answers and hangs up calls. The volume is contolled by the +/- buttons. Double pressing the center button calls the last logged call on your phone’s log. I wasn’t a fan of this feature. NOTE: the microphone worked, but because of the headset design and mic placement it wasn’t ideal and some friends and family said I sounded muffled or distant. Usually a pair of bluetooth monitors will exaggerate their range and battery life. I can confirm that is not the case with the X7. If anything I got more than four hours of playback time, and my range was exactly at around thirty feet and started to break up after going beyond thirty feet. I primarily did my demo with my LG G3 Phone via bluetooth. I also used my Toshiba Chromebook via bluetooth. I used Google Music downloaded in its highest download quality (320 KBPS) and I also streamed FLAC via Tidal streaming service. I make sure that any gear I test has a minimum of 30 hours of playtime before writing any type of review. These utilize a 6mm micro dynamic driver. While many might think that this would impact the bass response and their ability to extend into sub bass regions, it is actually the opposite. The X7 is a “Basshead Audiophile” tuning that I really enjoy. The sub bass extends down to the center of the earth without affecting the overall tuning too much, and my overall impression is that these sound big. The vocals sound natural and mid bass is very controlled and not overwhelming. The treble response is detailed and not harsh at all. 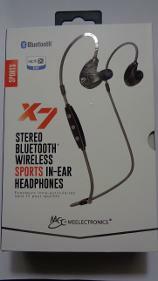 To be honest I wouldn’t want a sports earphone to sound any different than what the X7 offers. A good comparison would be a warmer, beefier and tamed treble version of the Sony MH1, or a tuning somewhat similar to the Yamaha EPH-100. I already touched on it but the X7 has sub bass for days. Its very forward in it’s lower bass tones, but it doesn’t carry into the midrange. Midbass is very controlled, and lower midrange makes male vocals sound very natural to my ears. The bass is boomy because of the boosted sub level, but the inner basshead in me really enjoys it alot, especially for commuting and working out. Yes, the bass slam can impact the overall tuning to a certain extent but not in the same sense that a forward midbass tuned IEM would. For commuting and working out, the bass helps these isolate even better than their fantastic fit and seal already does. For sitting at home and listening to music for enjoyment purposes the X7 bass can get overwhelming and slightly fatiguing depending on what you’re listening to. Midrange is very natural to my ears and slightly warmer in tone. It has slightly warmer tuning and has nice texture and resolution. When the bass hits hard on a track it can overwhelm the midrange at times. On a whole though, I really like it. With as much sub bass as these have, I almost wondered if these had two drivers before looking at the specs. There’s an incredible amount of sub bass slam, but the midrange and treble controls itself very well despite this and with pretty good separation. This is a unique and pleasant aspect about them. Treble is detailed, but also very tamed. It is the type of treble that will never get fatiguing. You will find the bass to be fatiguing before the treble is, trust me on this. Sub bass extension and depth makes these sound big on a whole there is a nice sense of separation for the most part. imaging is better than average in my opinion. I think this comparison is important despite one is a IEM and another is a full size headphone. The AF62 has a more balanced tuning, but midrange and treble on both models I found to be very similar. The AF62 is a more audiophile sound, and the X7 is a more consumer friendly tuning. If I had to pick one over the other I couldn't, because I would buy both and use the X7 for commuting and outside the house, and the AF62 for when I want to use bluetooth at home, and isolation isn’t as big of a deal. 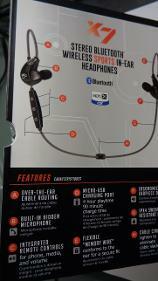 The first bluetooth offering from Brainwavz is solid in it’s tuning. It’s relatively more balanced than the X7 to my ears. However, the Brainwavs BLU100 does put a little more emphasis on the lower midrange that can put a little too much weight on male vocals and lower midrange frequencies, making it sound slightly unnatural to my ears. 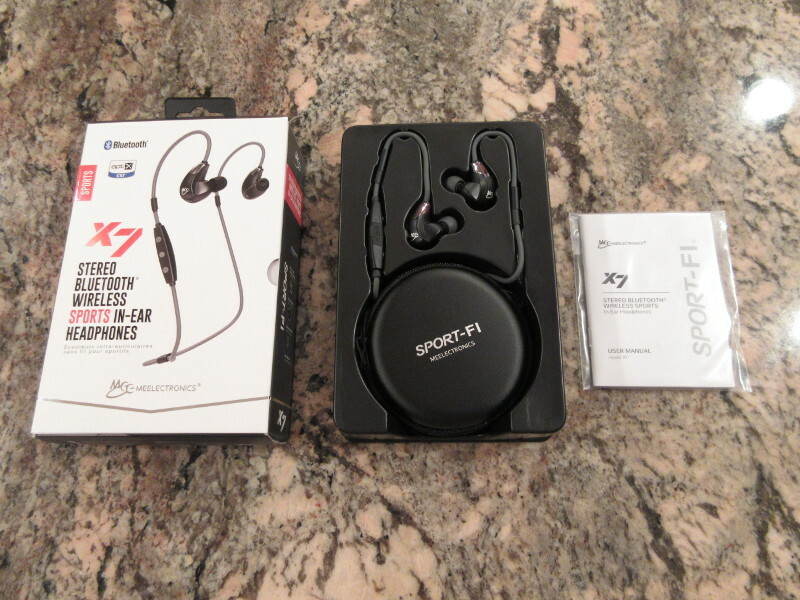 Albeit, the sound is very good and specs are similar in terms of range and battery life to the X7. The X7 offers much better ergonomics and fit as compared to the large barrel housing of the BLU100. I could go for a run with the X7, and couldn’t with the BLU100. If a fit that stays in place is important to you, the X7 is the way to go in my opinion. If you are looking for a great sounding bluetooth IEM, and price is a key factor and fitment isn’t at the top of the list, the BLU100 might be the answer. 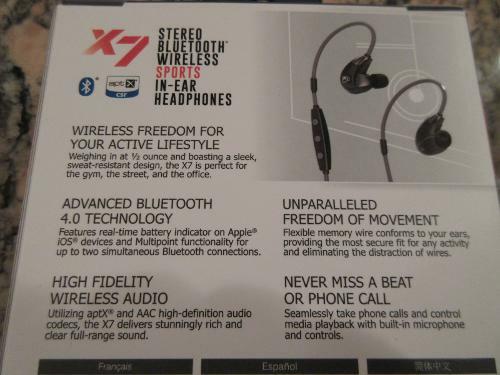 Having both of them and considering the applications I’m aiming to use bluetooth earphones for, I slightly lean more towards the X7 at the moment. 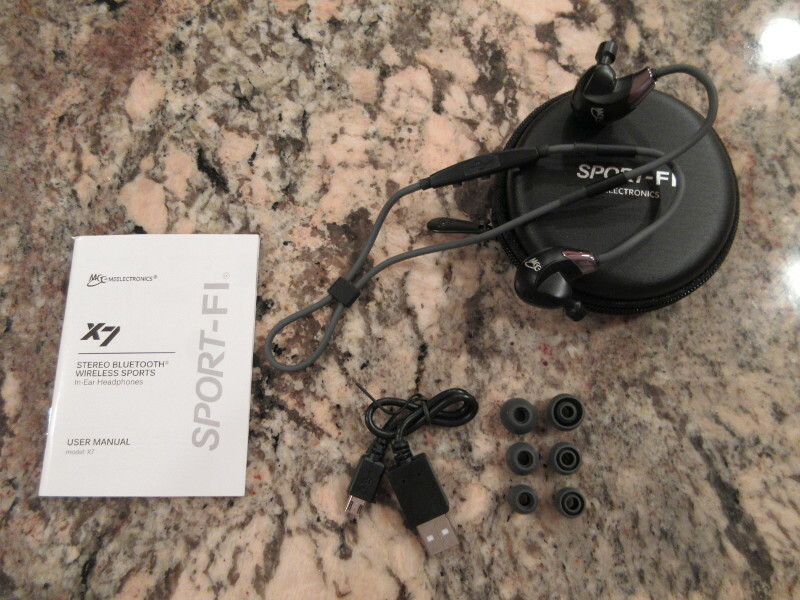 The Sport-Fi X7 is a great workout IEM that fits perfectly and isolates very well. It has really good sound quality and tuning that is geared towards making your afternoon run sound great. Their functionality is great, and forward sub bass works for almost all genres. 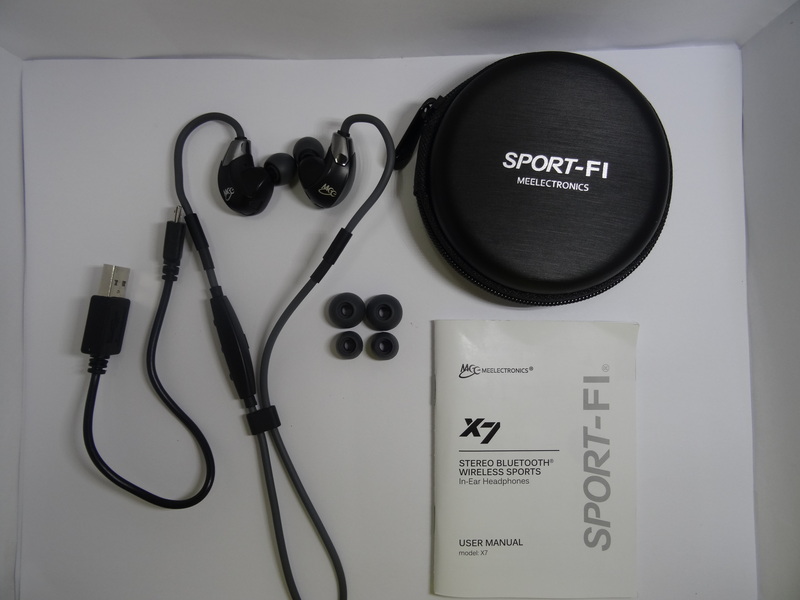 Whether it be a at the gym or commuting, you will feel well equipped with the new and easily affordable Sport-Fi X7 bluetooth headset from Meelectronics. @Hisoundfi : you nailed it! The ergonomics of fitment and a rare use of memory wire (I never seen one in this type of wireless headphones) - makes it stay in your ears. Majority of other similar type of wireless headphones stick out and use some sort of fitment fins to keep them inside.